(Part two) W. Scott Haine, professor and historian of food and sociability at the College of San Mateo, CA, was educated at the University of California, Berkeley (B.A. ), and the University of Wisconsin at Madison (M.A. and Ph.D). Professor Haine has published widely on the history and culture and customs of nineteenth- and twentieth-century France. His first book, The World of the Paris Café: Sociability among the French Working Class, 1789-1914 (Johns Hopkins University, 1998) investigates what the working-class café reveals about the formation of urban life in nineteenth-century France. His second book, The History of France (Greenwood Press, 2000) is a concise narrative that brings to life the compelling history of this fractious and fascinating country. Culture and Customs of France (Culture and Customs of Europe)(Greenwood Press, 2006), his latest book, is a thorough narrative of the glories that France continues to offer the world. In 2013, Scott presented to critical acclaim at the Western Society for French History his paper Group infusion: Crowd Culture Revealing the origins of Simone de Beauvoir’s café life and the entry of France into WWII. He is currently at work on a new project on cafés during the period 1934-1946 and writer Simone de Beauvoir and her intellectual involvement in Paris during WWII. One of Simone de Beauvoir’s biographers, Deirdre Bair, records that de Beauvoir’s first moment of “true liberty” came in a café, the Rotonde, when she and her sister Helene played hooky and drank a café-crème. At ages nineteen and seventeen respectively, they felt “incredibly grown-up,” and enjoyed themselves so much that before long they stopped going to art classes and spent the hours between eight and ten-thirty entirely in bars and cafes. AWP: You are the author of Group infusion: Crowd culture revealing Simone de Beauvoir’s café life and the entry of France into WWII. What inspired you to write this work? WSH: Once I began to work on café life back in 1976 I wished to find the best possible testimonies, naturally. I have never seen such rich nor more compelling examples than in the writings of this pioneering feminist philosopher, Simone de Beauvoir. AWP: You entrench your work in a different part of Simone de Beauvoir’s past, a personal and social narrative during the outbreak of WWII. What challenges did you encounter, and how did you unfold the story that you wanted to tell? WSH: My first exposure to her café life was in the first volume of her autobiography Memoirs of a Dutiful Daughter. I wrote a conference paper for the American Historical Association meeting in 1995 and became convinced that here was an extraordinary history of a woman forging her own identity with tools, philosophy and café life, that traditionally had been in the hands of men. De Beauvoir was able to become “just another café intellectual,” if you will, yet at the same time show how women could remake themselves in these public spaces without falling under male hegemony. After going through her WWII War Diary, I believe one can easily do a book on just her life in the café. The challenges have not been great with her writings, unlike most writers known for their café frequentations. Even Sartre is much less forth coming than de Beauvoir in his autobiographical writings. Here are some key points. But any glancing notice of her letters, autobiographies, or novels, reveal that this was merely a passing thought. She would continue to be a habituée of cafés up until the time when she and Sartre became so famous that going to a café became hazardous due to all the publicity seekers. AWP: Simone de Beauvoir (1908-1986), French novelist, essayist, biographer, philosopher, and political activist – what did café culture during the war imply for her? WSH: This child of Montparnasse, who was literally born above what would become the famous Café de la Rotonde in 1908, for a variety of reasons felt free to go to cafés as a teenager. I hope to show in subsequent work that women have gone to French cafés since their inception. Indeed, some of the first images of women in cafés were of aristocratic women beneath chandeliers sitting at marble top tables with dazzling mirrors enveloping the sociability. (Women of the lower classes, not surprisingly, had always been a part, even if a small one, of the more rustic tavern life of Paris.) De Beauvoir’s aristocratic and artistic father, or at least he aspired to fulfill these roles, was an inveterate café frequenter. But de Beauvoir, as we saw above, discovered the world of the intellectual and artistic cafés with her cousin during the Roaring 1920s (known as les années folles in France). “I calmed down and went out. The streets had a serious air about them. On the place Montmartre, a scuffle. A woman, I think, had called some fellow a foreigner, and he yelled at her. The people protested; the municipal guard intervened and grabbed the fellow by the hair—protests from the crowd—the guards got confused and told the people to move along. In general, the crowd seemed hostile to this hostility against “the foreigner.” I went to the Café Flore and wrote to Bost. AWP: Did de Beauvoir play a part in the French Resistance? WSH: A contentious question, which has been covered copiously. Neither de Beauvoir nor Sartre played an extensive role in the Resistance. Some scholars have accused them of at least passive collaboration. In essence they remained intellectuals during the war and the value of their “resistance” lies in their testimony and reflections upon human solidarity in the face of war and terror. Their fondest hope was that human beings would forge the social and political bonds to free themselves both individually and collectively. The above quote speaks to this point. AWP: Jean-Paul Sartre (1905-1980) – French philosopher, playwright, novelist, political activist, biographer, and literary critic – was a central figure in Simone de Beauvoir’s life. Do we know about Sartre’s writings of café life? WSH: Sartre’s autobiography, Les Mots (The Words) only covers his childhood and does not touch upon his adolescence and young adulthood. As a man he “naturally” had the right to go out into the world and café life was one of the givens of a male intellectual. Not surprisingly, Sartre’s writings on the café are not as penetrating as de Beauvoir’s because this was a space that was “naturally” open to him as a male intellectual. Though in his War Notebooks, the soon to be author of Being and Nothingness does note how the café supplied him, a thinker rooted in his thoughts, with the physical objects—pen, paper, table, coffee, tobacco (then)—that allowed him to not have to worry about these physical necessities during the day. Feeling so much at home in the café may be one reason Sartre perceived the way in which café waiters (in some of the most celebrated passages in the above mentioned book) “played” at their role as server. De Beauvoir, as the daughter of a well to do family that had been impoverished during WWI, could thus not expect a dowry for marriage and was told by her parents that she would have to make her own way. In her first volume of her autobiography and in her diaries we see de Beauvoir creating a distinctly public persona that transcended the Victorian norms of female propriety. In the passage I cited above from her Wartime Diary, de Beauvoir does not distance herself from the life of the café, as does Sartre, but begins to feel intensely part of it. Once he entered into the regular army and became just another soldier (even if in the meteorological corps) Sartre began to feel this same sense of solidarity. But French literary and philosophical critics rightfully point out that Sartre may have also been inspired by her Wartime Diary, which he read when he was on leave. In any case, out of the experience of war and occupation Sartre would develop his concept of a “group in fusion.” The first formulation of this is in Being and Nothingness, where Sartre hints at this concept later central to The Critique of Dialectical Reason (1960). Interestingly, and vitally for our purposes, Sartre’s first image of a group in fusion is drawn from café life rather than people gathered at a bus stop (as he often used in lectures and interviews) or in his description of the storming of the Bastille in the Critique. But Sartre never developed a theory of how to “use” the café for political purposes. Neither did Simone de Beauvoir in a formal manner, but as you read through all her writings a theory does emerge in outline. Here the key point is the permeability of the street and the café to one another and the way in which one can move conversation to demonstration in a seamless fashion, as was so often the case in France from the 1930s through the 1960s. AWP: In de Beauvoir’s work about cafés in Paris, does she follow the personal lives of philosophers and friends, between Sartre, and her intimate circle? WSH: Another great question, and one again surrounded with great controversy. In essence, after the publication of their letters and the memoirs of some of their circle of friends, these two great philosophers seemed to resemble the aristocratic salon manipulators in Les Liaisons Dangereuses more than modern egalitarian café philosophers. Neither Sartre nor de Beauvoir was really concerned about chronicling the intellectual life of the cafés of their era. Instead they used these spaces for conversing, thinking, writing and publicizing their own philosophies and to establish solidarity with the wide public in a visceral daily life fashion after that of much of the Parisian and French population. All their lives they rejected the respectable domestic spaces of the bourgeoisie such as private salons, gardens, and offices. AWP: How descriptive were de Beauvoir’s writings about common life on the street and in the cafés and the goings on around her? WSH: Her memoirs and diaries are quite descriptive. What I find fascinating in her Wartime Diary is that as she gets deeper into the writing process that will result in her first novels and philosophic publications by the end of the war, she shifts from a description of the surroundings and clientele of the café to the progress of her own writing. In short, the café becomes less an observatory and more a study. AWP: Does de Beauvoir write about fluctuations in emotions when war is about to start? Did her days have a certain rhythm? WSH: She scrupulously recorded the range of various emotions from terror to acceptance, from bravery to panic, that engulfed the entire Parisian population during the weeks leading up to and then the outbreak of WWII. AWP: Which cafés during the Occupation in Paris remained open? Were there cafés that played a significant role in culture, politics and intellectual life that closed? WSH: Since Paris had thousands of cafés and a highly diverse clientele it is hard to generalize. Of course the cafés that de Beauvoir, Sartre and other intellectuals made famous during the War included the ones at Saint-Germain-des-Prés, though she also frequented the cafés around her original family home of Montparnasse. In her Wartime Diary she notes that the Café de Flore did close for a while at the start of the war. In an upcoming book I go into great detail on the severe toll the war took on the café trade, helping to set in motion a decline in the number of cafés that has continued to the present. AWP: What were the long-term trends going on in cafés during that time? WSH: This question leads logically onward from my last points. During the late 1930s, at the end of the Popular Front, France had its greatest number of cafés ever, more than 500,000! (But I should note here that the historical enumeration of the number of cafés both in Paris and the rest of France is amazingly complex for a variety of reasons.) But by 1946 the number across France had dropped to 315,000. I am not certain yet exactly on the drop in Paris in the 1940s but I can attest that the number of pages devoted to cafés in the Paris telephone directory was cut in half during the 1950s. Yet even as the number of cafés declined, their importance for intellectual and cultural life remained central. Indeed, one can argue that between 1900 and 1970 the Paris café had its golden age in terms of intellectual and cultural influence. (In short not during the period between, for example, Baudelaire through Verlaine and Manet though Van Gogh or Toulouse-Lautrec.) Between the 1860s and World War I, in general, literary and artistic salons declined with much of the intellectual activity that once went on in them being transferred to cafés. Note that both Dada during WWI and Surrealism afterwards, both in Zurich and Paris, take place in cafés. Here was a space that inherently challenged the bourgeois proprieties of family and respectability that Sartre and de Beauvoir embody in their own lives. AWP: In your paper you write about “Group infusion: Crowd culture”. What is this notion and how did it jump cultural norms during the Occupation? WSH: The concept of a “group in fusion” that I noted above was explicitly developed by Sartre while working on his treatise of what is essentially political sociology The Critique of Dialectical Reason, his attempt to fuse Marxism with existentialism. It is a sort of utopian hope based on the necessity of ordinary people at certain crisis moments to join together in a common endeavor to overcome social, economic, or political problems. Sartre’s hope was that this social process might become the norm in society and that as a result a nation, city or community would in essence govern itself. But as I noted de Beauvoir, on this point as on so many others, pioneered ideas and images that inspired Sartre. But I should note it was Sartre, naturally at a café, who suggested to de Beauvoir that she write an existential analysis of the condition of contemporary women. So their intellectual processes were very much reciprocal as is the case in any fine café discussion. AWP: Your research is exemplary. How did you accumulate and obtain this information? From memoirs, letters, eyewitnesses, among others? Was the information primarily in French? WSH: Just as the café hides in plain site amidst the swirl of daily life, so evidence of its influence on intellectual and cultural life is also buried amidst almost any type of sources. Thus the researcher must have an acute eye for the references to these spaces. Let me provide an example. One would not think that the Hemingway “novel”—a large and coherent but lacking a final-edit book in his archives—True At First Light (that appeared during the centennial of his birth—1999)—would contain much if anything about his café life in Paris. It is another story of big game hunting in Africa. Yet half way through he digresses and talks about the small seemingly side street cafés where he went to write. This is important because Hemingway is famous for asserting that café life could harm a writer because rather than writing in private an author might pour out her insights in public and not have the energy to go home and write down what she had already created. The lesson for the student of the café is that it really does pay to skim or speed read large numbers of books in a wide range of genres. Café life is part of our social unconscious that is both present and hidden in the process of daily life. The café is an image, a trope, a symbol commonly drawn upon in a range of social utterances from national policy statement to local rumor. AWP: What was the most surprising thing you learned about the war from the historian’s distance of nearly sixty years since its end? WSH: As far as from de Beauvoir’s Wartime Diary, the sense of how nothing is inevitable. Today we think that the Nazi war machine simply rolled over Poland in September 1939, but in passages de Beauvoir shows that there were reports during this month when the Polish army did seem to be halting the Nazi advance. Note that the term Blitz Krieg was coined first by an American journalist (though the concept had been developed by the German and French military thinkers during the interwar years and implemented by the rump of the German army as a means of compensating for the restrictions under the Treaty of Versailles). In short when we read history “backwards” it seems to be a coherent narrative but read “forward” (as it is actually lived) nothing is inevitable. A diary allows us to re-imagine the unfolding of historical events when the outcome was far from certain. Many thought that Nazi Germany after its easy and fast victory over France in late spring of 1940 might rule the European continent for decades. 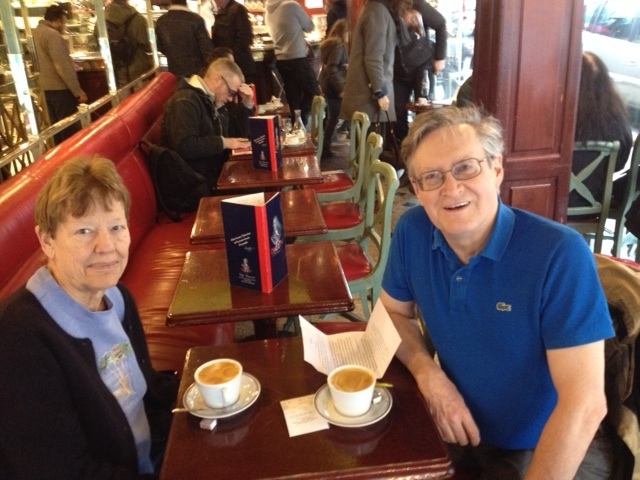 AWP: What was the most surprising thing you learned about Paris cafés during the Occupation, chronologically or geographically by arrondissement? It has also been surprising the extent to which the right and the left during the Occupation in Paris—in short the communists and the various French fascist parties and para-military groups such as the Milice which was incorporated into the Vichy police forces in January 1943—used cafés in similar ways. And their leaders and followers had similar life styles even though in theory the Vichy Regime and collaborationist followers or critics claimed to favor what we would call “family values” and opposed the “degeneracy” of café life for causing the French birth rate to fall and the nation to become flabby apéritif sippers rather than vigorous soldiers and athletes. Acknowledgement: Bailey Roberts, Linguistics student at Macalester College and English editor for A Woman’s Paris. You may also enjoy A Woman’s Paris® post A literary feast – Cafés and culture in Paris’ 9th arrondissement by Parisian Flore der Agopian. Paris has always been an inspiration for writers and painters, both from France and all over the world. Flore explores how cafés in nineteenth century Paris inspired literary figures Emile Zola, Alexandre Dumas, George Sand, Guy de Maupassant, Marcel Proust and French painters Edgar Degas, Eugène Delacroix, Camille Pissaro, and Edouard Manet. Including a list of current cafés in Paris’ 9th arrondissement. Stars, Stripes and Seine: Americans in occupied Paris 1940-1944, by Alan Davidge. 5,000 Americans refused to leave Paris after war broke out in September 1939. Who were they? Read the stories of how Josephine Baker, Sylvia Beach, Arthur Briggs, Drue Leyton, and others lived and breathed Paris during the war. Text copyright ©2014 W. Scott Haine. All rights reserved. Another fascinating insight into Paris during the war. I have only ever had access to secondary sources in discovering how people adapted to the occupation in Paris and I admire Professor Haine’s ability to prospect richer veins. I live in rural Normandy and regularly find much more rustic anecdotal evidence of what took place during those traumatic years. My parents’ families had to cope with the horrors of the London Blitz but once the dust had settled the enemy were still hundreds of miles away. Not so with my French neighbours. I thoroughly enjoyed reading this article. Thank you. Leave a reply on "French Impressions: W. Scott Haine on the origins of Simone de Beauvoir’s café life and the entry of France into WWII (Part one)"